Our Costa Rica facts page contains an overview of articles that provide details about Costa Rica, its people, its history, government, political structure, social values, policies, geography, weather, plants and animals. These articles and pages are meant to educate and inform users of everything they want to know about Costa Rica. Pura Vida! Costa Rica is cherished as one of the world’s most popular eco-tourism destinations. Thanks to its beautiful landscapes, pristine beaches, myriad adventure activities and proximity to the U.S., the country draws more than two million tourists each year. Learn more about this amazing nation with these interesting facts that helped make this paradise one of the “happiest countries” on Earth. Costa Ricans live the Pura Vida by enjoying life’s little pleasures. Ticos, a term used to describe Costa Ricans, spend time with friends and family, enjoy meals together, and just explore the great outdoors in their beautiful country. According to the Happy Planet Index, Costa Ricans enjoy the highest life satisfaction in the world. Now that’s Pura Vida! Why not visit Costa Rica and come joins us in the happiest place on earth? With no standing army, the Costa Rican government has poured those funds into both public education and preserving the natural heritage. Today there are more than 100 protected areas consisting of reserves, wildlife refuges and national parks in Costa Rica. Costa Ricans also enjoy one of the most modern public health care systems, which was recently ranked 36th in the world by the World Health Organization. Additionally, the country boasts one of the highest life expectancy rates at 77 for men and 820 for women. The Flag and Shield of Costa Rica are an outstanding symbol of the country’s freedom and rights for the people. Much history made what the flag and shield are today. Look here for Costa Rica facts on the Flag and shield and the influences that created it. Unlike many of its Central American neighbors, the government in Costa Rica is a stable democracy, with presidential elections that take place every four years. Laura Chinchilla was the first female president elected in this country. Former Costa Rican president, Jose Figueres Ferrer, abolished the Costa Rican national military in 1948 after a grueling civil war. Since that time, the country has functioned peaceably with no civil unrest. Find out what currency Costa Rica uses and how the dollars is used here. There is a lot to know about money when you travel and this article will help you out. Learn all about the people that made Costa Rica what it is today! Do you need help from a consulate in your home country? Here is a list of the phone numbers and Locations of Costa Rica Consulates within the United States. As the largest and most populous city in Costa Rica, San Jose is a popular destination for tourists and expats alike. Named after Saint Joseph, it is in the heart of the country, and its inhabitants are understandably proud of their home. It also feels surprisingly modern and lacks the poverty of other Central American capitals. Explore San Jose and discover a thriving cultural and business scene! Find out about some of the amazing history in Costa Rica. For example, the Diquís Delta stone spheres are one of Central America’s most quixotic and strange archaeological findings. Believed to be around 2,000 years old, thousands surprisingly uniform stone spheres, ranging in diameter from 4 inches (10 cm) to 8 feet (2.5 m, discovered in the 1940s. Many find stones placed close to graves, in various shapes. Also, thought the spheres were created by the ancestors of the Boruca, Térraba, and Guaymi Indigenous tribes. Check out more below. 1539, the first time in recorded history that the term Costa Rica, or Rich Coast, was used to describe the territory between Panama and Nicaragua. Christopher Columbus was the first European recorded to have landed on Costa Rica’s shores on September 8, 1502. Between Uvita Island and the current port of Limón. The Costa Rica population is approximately five million. Per a government decree in 1869, education is both free and mandatory for all citizens in Costa Rica. The country’s education system is ranked one of the top in all of Latin America, with more than 4,200 schools scattered throughout the nation. Costa Rica has a 96% literacy rate, one of the highest in the world. Juan Santamaria is a prime symbol of this country and how it became independence. There is even an airport named after him. Find out more Costa Rica facts about Juan Santamaria here. The official language in Costa Rica, is Spanish. Why not try to pick up some of the language and slang while you are here? Discover the importance of rice and beans and all the ways Ticos include it in their diet! The food has a history all on its own from the indigenous cultures to the Spanish colonization. Costa Rica has a national tree and a national flower: the Guanacaste tree and the Guaria Morada orchid. Thanks to its stable and developed economic base, Costa Ricans enjoy a higher standard of living than many of their peers in neighboring countries. Although the Costa Rican economy is not as powerful as that of the USA or the European nations, it certainly punches above its weight and was lucky enough to recover quickly from the global financial crisis. There is so much to discover about this amazing country. The sun rises and sets at 5:45 am and 5:45 pm every day of the year. Isla del Coco is the most remote region of Costa Rica, nearly 360 miles from the mainland into the Pacific Ocean. Also, it is the largest uninhabited island in the world with an area of about 24 square miles. 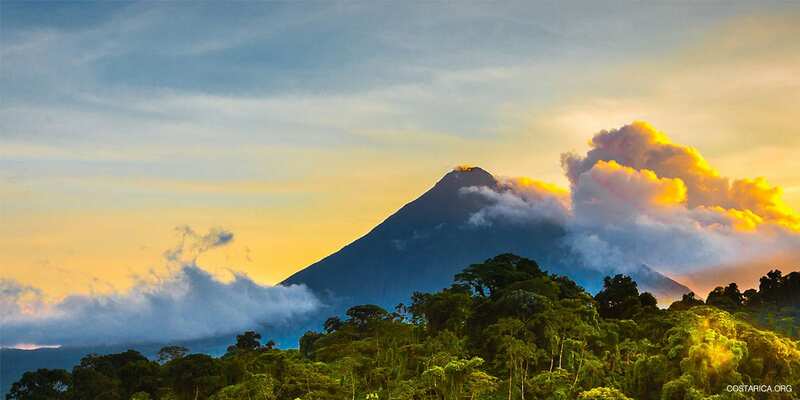 Costa Rica has over 120 volcanic cones and 7 active volcanoes. Check ou the articles below. Costa Rica is divided into 7 provinces: San Jose, Alajuela, Heredia, Cartago, Guanacaste, Puntarenas and Limon. Here we have all the maps you need for your travels within Costa Rica. The Irazu Volcano is Costa Rica’s highest volcano with an elevation of 11,259 feet above sea level. In fact, the Chirripo Mountain is the highest peak in Costa Rica at 12,500 feet. The country’s lowest nadir is 790 feet below sea level in the caves of Barra Honda National Park. The weather here is tricky it rains when it wants and really all that depend on what part of the country you are in. Check ouy this article o the weather. The climate affects every aspect of this country from how it was shaped to what you going to do during the day. Find out more here. Costa Rica has two seasons a year, the dry season and the wet season. While the dry season is a great time to travel so you don’t have to worry about the rain, the wet season has its perks as well. All of the vegetation comes alive and Costa Rica glows green! What questions do you have about Costa Rica? There are many but here are some of the most frequently asked questions to help you on your next trip to this wonderful country. Find out where Costa Rica actually is on the map. it isn’t a big country, you may not have even heard of it until now but you are sure to know where Costa Rica is once you read this Article. While Costa Rica takes up only .03% of the world’s land space, it contains 6% of all known living species and has the densest biodiversity on the planet. This article provides you with the current time in Costa Rica and also expands on the notion of Tico Time. Though small in size (similar to West Virginia), Costa Rica is home to an estimated five percent of the Earth’s flora and fauna. The entire country spans just 19,730 square miles, but its multiple ecosystems and microclimates accommodate such diversity within its borders. Almost 95% of Costa Rica’s energy is derived from renewable resources- either geothermal or hydroelectric means. With this abundance of clean energy, the country is well on its way to becoming entirely carbon neutral by 2021. Thanks to its progressive environmental policies and government-sponsored reforestation programs, Costa Rica is also labeled 5th Greenest Country according to the Environmental Performance Index (EPI). Based on scientific research, the Nicoya Peninsula was deemed one of the planet’s seven blue zones: Areas where people live longer, healthier and happier lives. This is largely attributed to the outdoor lifestyle, closeness to family and healthy diet.